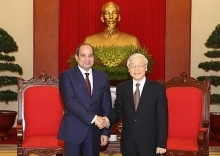 General Secretary of the Communist Party of Vietnam (CPV) Nguyen Phu Trong hosted a reception in Hanoi, on November 9, for Chilean President Michelle Bachelet, who is on a two-day State visit to Vietnam. 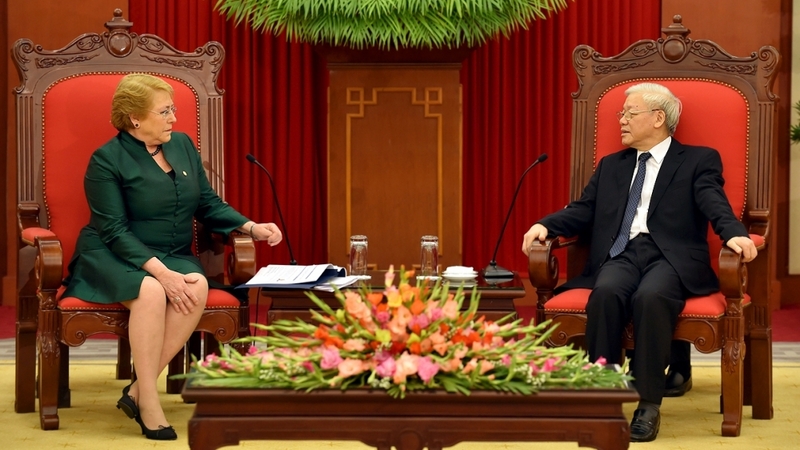 President Bachelet lauded Vietnam’s achievements and experience in national construction and development, as well as the country’s prestige and position within the region and around the globe. She briefed her host on Chile’s current situation, as well as the outcomes of her working sessions with the Vietnamese leaders, while affirming her determination to promote solidarity, friendship and cooperation between the two countries in all fields, thus making the bilateral ties deeper, more practical and effective. Party General Secretary Nguyen Phu Trong highly valued the whole-hearted support that the left-winged and progressive parties, as well as people of Chile, have given to Vietnam during its struggle for national liberation and reunification in the past, as well as its current national construction and defence. He briefed his guest on the major information in Vietnam, as well as the outcomes in implementing the 12th Party Congress’s resolutions. The Party chief expressed his delight at the growing economic, trade and investment cooperation between the two countries, hoping that Vietnam and Chile would become key factors in fostering the connectivity between the ASEAN Community and other integration mechanisms in South America of which Chile is a member. He highlighted his wish to further strengthen the friendship and partnership with the Socialist Party of Chile led by President Bachelet and other political parties of Chile, contributing to enhancing the traditional solidarity and friendship that exists between the two States and people.